Cooking prime rib the first time around will result in a silky, delicious meat that is worthy of royalty. Don't know how to do that? Click the link for my fool proof method, and then come back to this page. 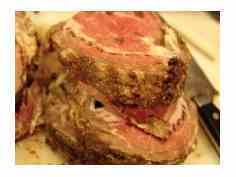 If you cooked your prime rib to medium rare the first time around, you are in a perfect position to create one of the most delicious versions of prime rib, and that is blackened prime rib. This method of cooking prime rib is easy to do as long as you have a legitimate cast iron skillet and a outdoor grill to blacken the meat outdoors. If done right it really smokes, and you don't want that in your kitchen. The prime rib will have a caramelized surface on both sides that is loaded with flavor and texture. To be perfectly honest, I like this better than traditional prime rib, although it's just a higher degree of love, as I love them both. The blackening rub is very important to the success of this method. The night I fixed the dish I didn't have all the ingredients needed to make my own rub, so I used store bought that I had in the cupboard. Below is a traditional blackened rub recipe. The video does a good job of demonstrating the process. Simply put, you carve the meat to 3/4 of an inch to 1 inch of thickness. You heat up the cast iron skillet as hot as you can get it. It's called "white hot," because you will see white flakes floating in the air. You brush melted butter on both sides of the steak and hen apply equal amounts of rub on both sides of the steak. You then place the steak in the "white hot" skillet and watch the smoke! I cook mine about 60 to 75 seconds on both side. Serve with a horseradish sauce and enjoy! Leave Cooking Prime Rib and Return to BBQMyWay Homepage.